Pepsi in a glass bottle....remember those days? It’s just one of those things from childhood I get all nostalgic for. I know why they stopped putting pop in glass bottles, but I still miss it. The last couple years, I’ve had some luck finding glass bottle Pepsi’s like this at Mexican grocery stores. I’ve never figured out why it would be cost effective to still market glass bottles in Mexico but not the U.S., but I’m not complaining. Today, I needed some more paprika, so I went to American International Bulk Food (review HERE). I found the bins with Spanish paprika and filled a bag. I’ve been doing a lot of barbecuing the last few weeks and gone through a ton of paprika, so I stocked up. As I was making my way to the check-out, I noticed a cooler with bottles of Coke. Since I’m not a Coke fan, I didnt’ grab one, but I did notice some Pepsi near the back, so I grabbed one. By comparsion, the Pepsi in glass bottles is much more expensive than in a plastic bottle, but everytime I see them, I buy a couple anyway. The only other place in Lansing I’ve seen them is at Tony’s Liquor Store on the corner of Cedar and Miller where they sell them 2 for $3. It’s just one of those stupid things from my childhood that I can’t seem to shake. It doesn’t taste any better and it’s harder to drink, but I love it. 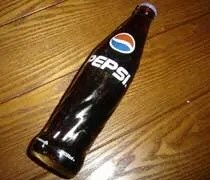 This bottle of Pepsi lasted all of 2 minutes.